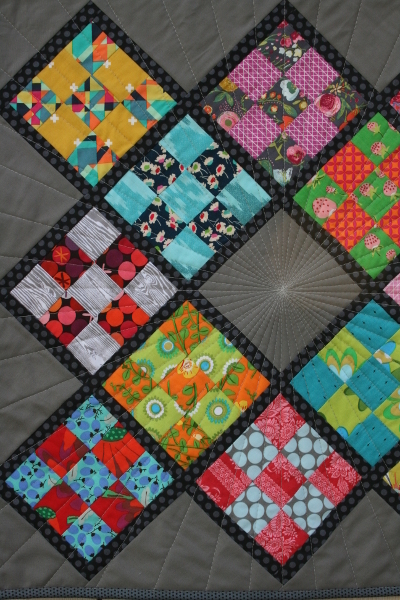 In November my friend Pamela hosted a mini quilt exchange. I was so excited to be invited to participate, but nervous as could be about it. I’d never done an exchange before and was afraid my offering wouldn’t be good enough. I had an idea I’d thought about for weeks but had to skip because of time constraints. 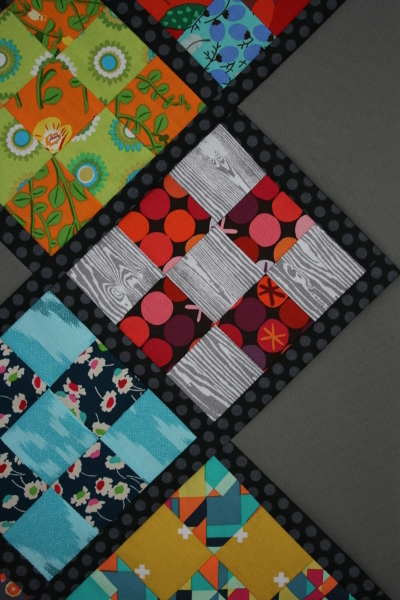 Finally I got out some of the leftover scraps from Scarlet’s quilt and started playing with them. I settled on this layout and got started. 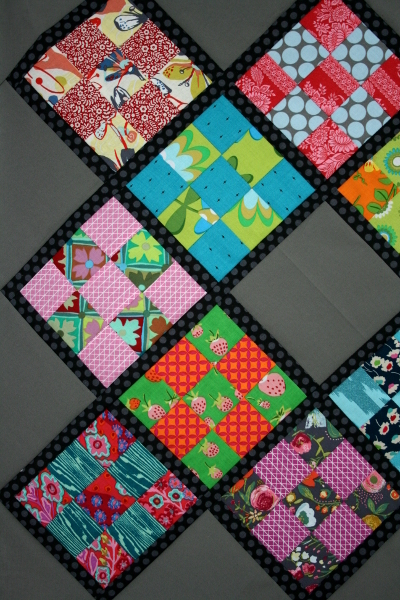 The inspiration for this mini quilt was three-fold. I’ve never made the granny square quilt I pinned forever ago. I also bought Camille Roskelley’s Niner pattern, but have never even opened it up. Finally, I’d been looking at some photos of stained glass windows, admiring the beauty of the light and color between the leaded glass. I sewed a dozen little nine patches and then started sashing them with a thin strip of black with gray polka dots. I used the last of my dark gray solid (I love this color and can’t believe I never wrote down the manufacturer, color, or even where I got it!) for the center block and setting triangles. Soon it was all put together and actually looked good! Relief! Next came stress about quilting it. 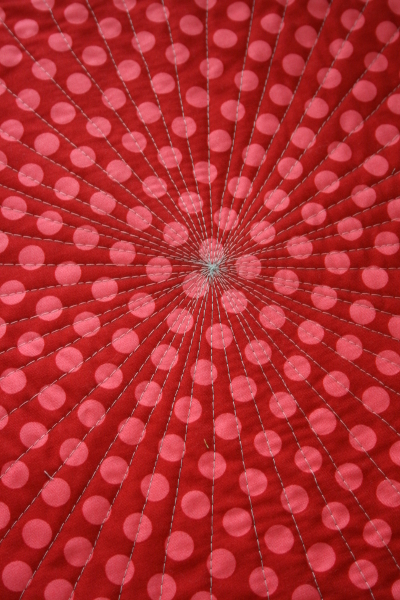 I wanted to do something to make the center block awesome but didn’t want to highlight my poor fmq skills. 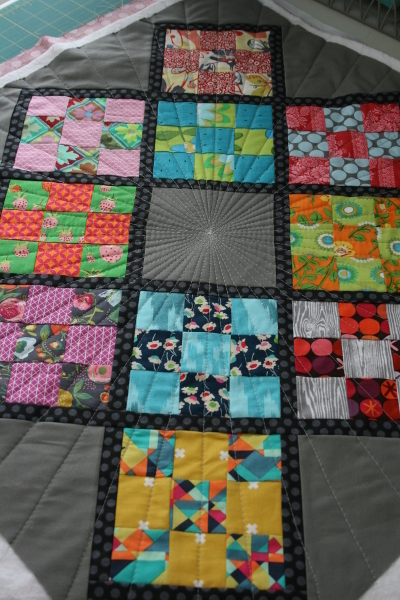 At last I chose straight line quilting and went to work with the hera marker. 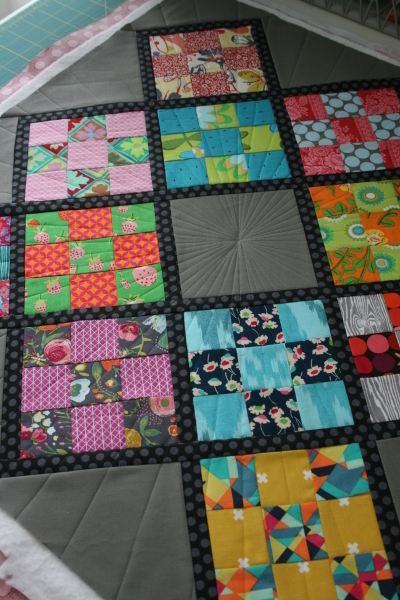 Above is what it looked like with all my quilting lines marked. It looked awesome so I knew I was on the right track but I did wish for a minute that the lines would magically become quilting. I was so afraid to mess it up! 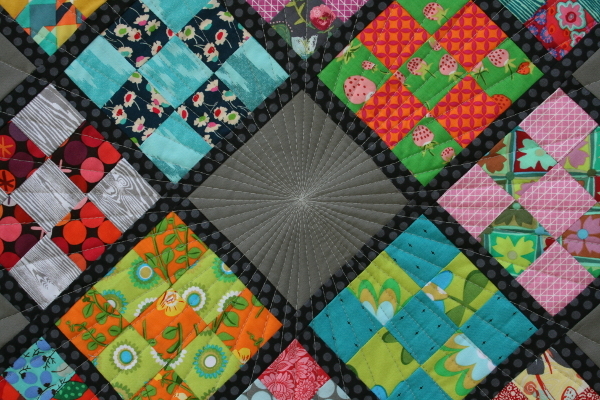 Here it is, quilted in a medium gray thread. Not too bad! Actually, I was ridiculously happy/relieved that it worked. I learned some good things through this experience. While I am likely my own worst critic, I am also accepting of my own work. I know the story behind the decisions, the time constraints, the intention and the vision. So I roll with the imperfections pretty well because at the end of a project I’m reminded what a gift it was to squeeze it in at all. It terrifies me to sew for money because I feel like getting paid would require total perfection. Sewing for a swap felt a little like this. I didn’t want the person who opened mine to be disappointed! I was crazy nervous at the party and realized I may have a few lessons to learn about confidence when surrounded by quilters I admire. When my package was finally opened, no one looked my way. It took a few minutes for them to figure out who made it. I knew the design was outside what might be called “my style” and yet I really love it. It was harder to give away than I thought it would be, a reminder that when we create things, we put pieces of our hearts in them and letting them go can be bittersweet. 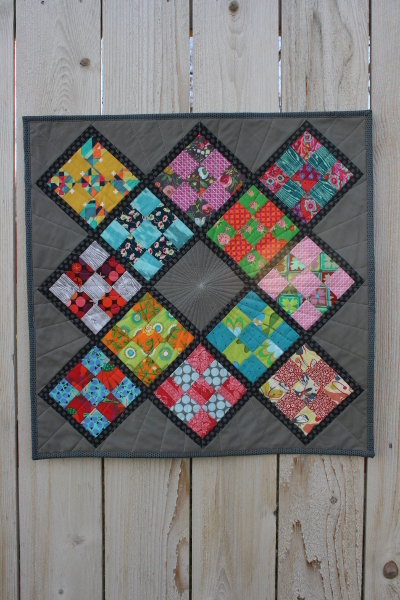 It would be fun to make a second one to hang in my laundry room with the three other mini quilts there. We’ll see if I ever take the time to do it. I’m so glad I got to participate in the swap despite my (out of character) nervousness. It was a good experience in creativity and self-expression! 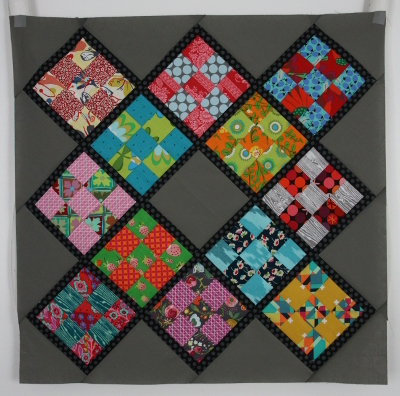 love your nine patch quilt! Jennifer I love this mini, and was sad when it got stollen from me. I’ve been thinking about it a bunch! It’s beautiful!